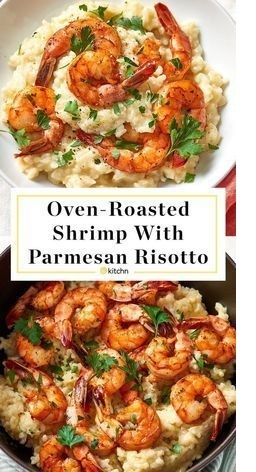 A dinner party-worthy recipe for creamy Parmesan risotto that's topped with simply roasted shrimp. Arrange rack in the middle of the oven and heat to 400°F. Rinse the shrimp and pat them very dry. Place on a rimmed baking sheet, drizzle with the oil, sprinkle with the paprika and a generous quantity of salt and pepper, and toss to combine. Spread them in an even layer and refrigerate while you prepare the risotto. Warm the broth in a medium saucepan over low heat. In a separate Dutch oven or wide, deep sauté pan, melt the butter over medium heat. Add the onion and garlic and cook until soft and beginning to brown around the edges, 2 to 3 minutes. Add the rice and stir thoroughly to make sure it is coated with the butter and onions. Cook the rice for 1 to 2 minutes more. Add the wine and cook, stirring and scraping the bottom of the pan until the wine has evaporated.